I’ve been working really hard on my kitchen, and you are sort of getting a sneak peek at some of the projects that I haven’t shared yet! 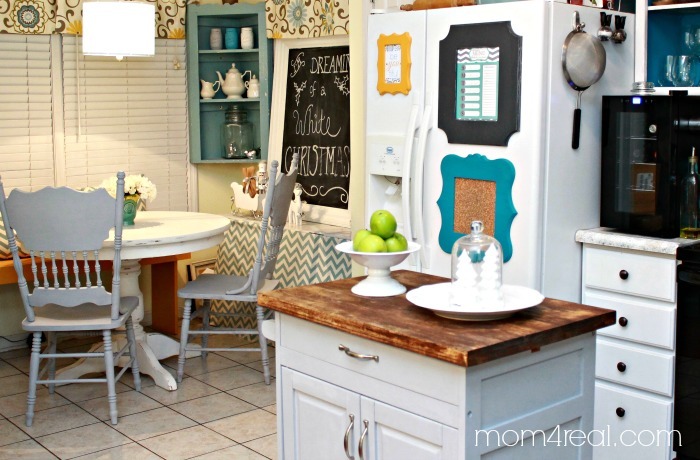 One of the things I am really trying to do is reduce the clutter and make my kitchen peaceful again. I just operate better when the clutter is minimal. 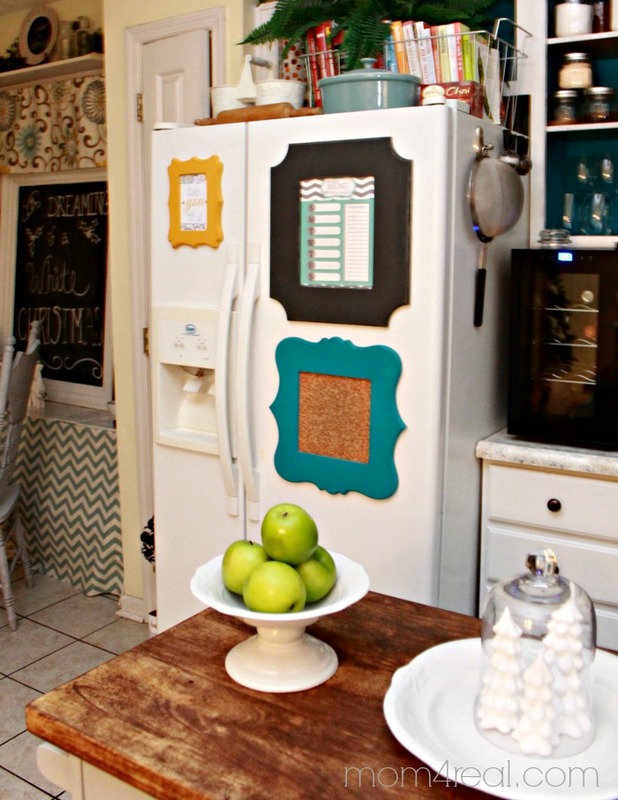 When I got the chance to review some of Cut It Out’s awesome wooden picture frames, I had big plans for a feature wall in my living room, but one day when I was working in the kitchen I had an epiphany of sorts…I looked up from where I was painting and saw the front of my refrigerator covered in papers and thought…why does the front of the fridge always have to look like such a mess? Why can’t it just be pretty? I mean, here I am working so hard to make my kitchen pretty and clutter free only to see a big bunch of clutter on the fridge. Then it dawned on me…use those Cut It Out frames!!! I went to my garage and grabbed them, then sat down in front of the fridge. I knew I wanted to have a menu there so my family could know what to expect, and I knew that I wanted to be able to share some of our kid’s awards and such, so I would need to find a way to do that, and then, hmmm….something pretty and inspirational. So, this is where I began…with a sweet quote. I used the Chandler 4 X 6 for this one. 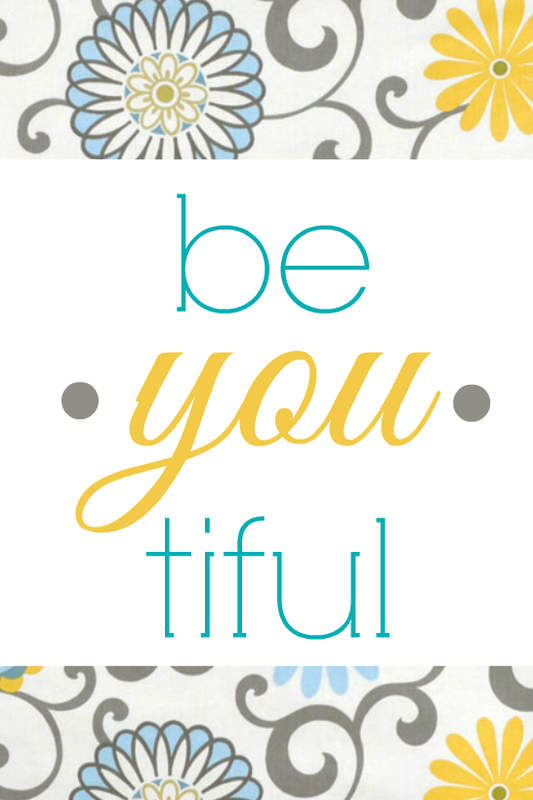 A reminder to just be you, because you are beautiful. At least that is how I read it. Every time I see this, it just makes me smile. If you would like a copy of this, I made a little 4 X 6 printable that you can print directly from your computer. Simply click HERE to download it for free! This is how it will appear once you print it out! My inspiration for this printable is the fabric in my breakfast nook from OnlineFabricStore.net, which I’ll be revealing in full next week! So, I started with the printable, then put a lovely dry erase board menu in my Parker 11 X 14 frame. I finished by placing some cork board in the Balboa 8 X 8. I simply attached them to my refrigerator using hot glue. I know…you are thinking I should have used some crazy strong magnets. No thank you. I want them to stay in place, and hot glue will not pull the paint off of the fridge as long as you blog it with a hair dryer when you are ready to remove them. I am soooo pleased with the way they turned out. My fridge is pretty! Who can say that? I painted all of my frames using Americana Decor Chalky Finish Paint from The Home Depot and finished them off with Creme Wax. These frames come unfinished so you can paint them any color you like or even decoupage them! The possibilities are endless! 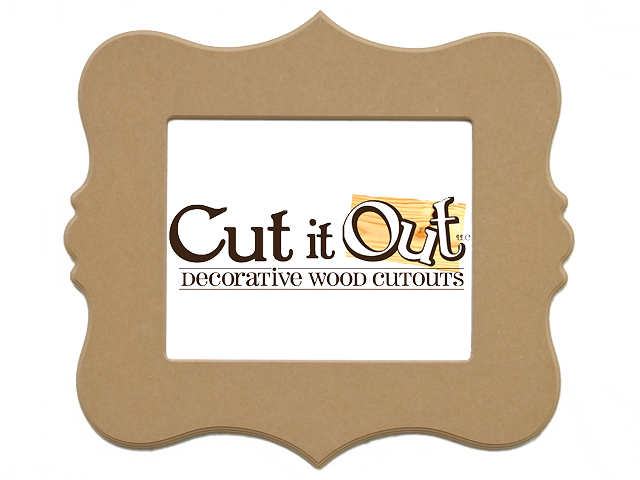 Cut It Out specializes in unique, high quality, unfinished frames, letters and words that will make a stunning statement in your home. Check back often, they are always expanding their selection and adding new designs they know you’ll love. The folks at Cut It Out Frames are allowing me to give a $50 credit to one of you! Simply use the Rafflecopter below to enter! Oh wow! What a small world! We absolutely love Lexington and live in the Hamburg area…the horse farms here are my favorite! I’m a fan of the Chandler! Thanks for the printable! 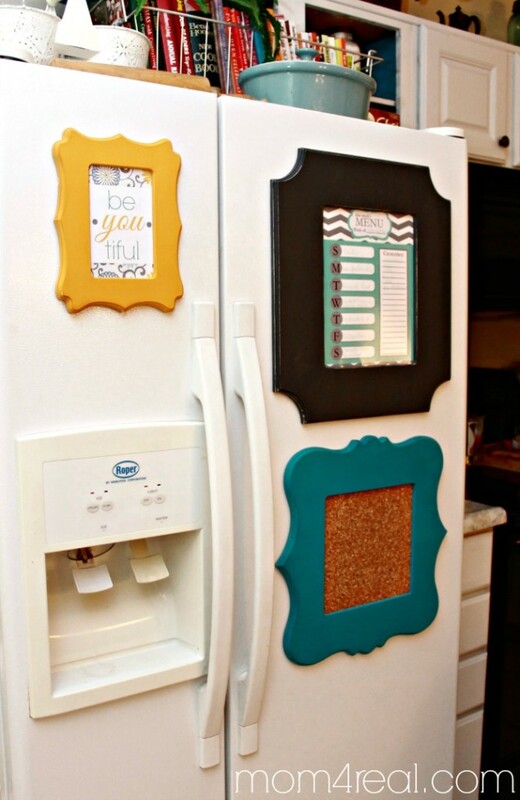 Your fridge looks awesome! I love the Newport double layer. These are awesome! There are so many great styles to choose from! I like the classic style of the Parker frame. I love the round frames- they have so much potential! Very cool ideas! I love the colors you chose also. Fun, fun, fun! Thanks for all the great ideas!!!! I have frames like this on my daughter’s wall. I mounted a piece of scrapbooking paper in them and a clip so she can change out the pictures as she likes. Thanks for sharing the frames. 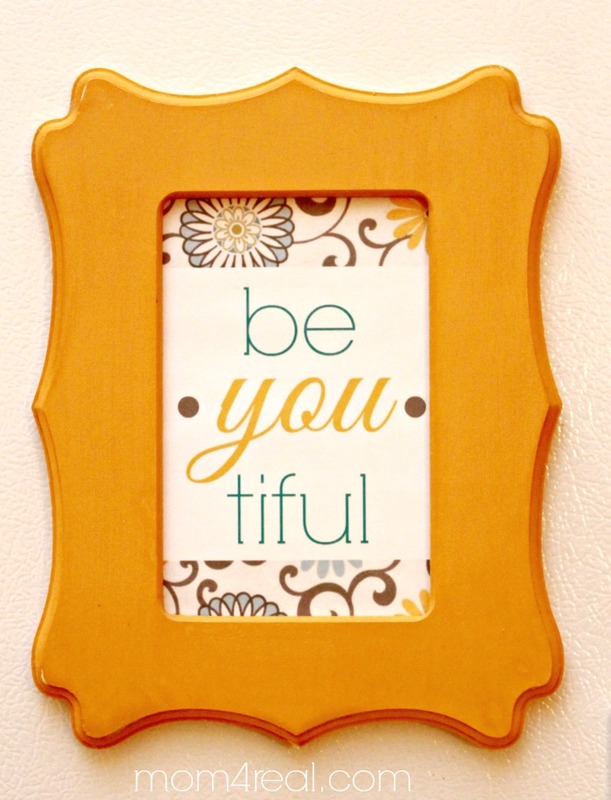 I love the beYoutiful printable. Is there any way you would make it so I can print it in a 8×10 or 5×7? I really want to put it in my daughters bathroom but I need it bigger.